For the airport, see Bratislava Airport. Milan Rastislav Štefánik (Slovak pronunciation: [ˈmilan ˈɾascislaʊ̯ ˈʃcɛfaːɲik]; 21 July 1880 – 4 May 1919) was a Slovak politician, diplomat, aviator, Freemason, and astronomer. During World War I, he served at the same time as a general in the French Army and as Minister of War for Czechoslovakia. As one of the leading members of the Czechoslovak National Council (the resistance government), he contributed decisively to the cause of Czechoslovakian sovereignty, since the status of Czech- and Slovak-populated territories was one of those in question until shortly before the disintegration of the Austro-Hungarian Empire, in 1918. His personal motto was "To Believe, To Love, To Work" (Veriť, milovať, pracovať). Štefánik was born in Košariská, Austria-Hungary (now Slovakia), on 21 July 1880. He had 11 brothers and sisters, two of whom died at a young age. His father, Pavol Štefánik, was a local Lutheran pastor, and his mother was Albertína Jurenková. He attended schools in Bratislava, Sopron and Szarvas. In 1898, he began studying construction engineering in Prague. In 1900, he transferred his studies to Charles University, where he attended lectures in astronomy, physics, optics, mathematics and philosophy. For the 1902 summer semester, he went to university in Zürich. The Prague years had a great impact on Štefánik because he met many important personalities there. The philosophy lectures were given by Tomáš Garrigue Masaryk, the future first president of Czechoslovakia, who inspired Štefánik with the idea of co-operation between the Czechs and the Slovaks. Furthermore, Štefánik very actively participated in the work of the Slovak student association, Detvan, (and within Detvan, the so-called Hlasists group); he became acquainted with Vavro Šrobár. His studies were financed largely by Czech associations, including Českoslovanská jednota (Czechoslavic Unity) and Radhošť since he could not afford them himself. In Prague, he wrote political and artistic texts in which he tried to inform the Czechs of the disastrous situation of the Slovaks at that time. He graduated in 1904 with a doctorate in philosophy and with knowledge of astronomy: his thesis about a star which was discovered in the Cassiopeia constellation in 1572. In 1904, he went to Paris to find a job in astronomy with a recommendation from a Czech professor who was known in Paris. Initially, he had no money and no command of French, but he was nevertheless able to obtain a job at the famous Paris-Meudon Observatory after its director, Pierre Janssen, one of the cofounders of astrophysics, saw Štefánik's talent. Štefánik owed to Janssen and Camille Flammarion his social, political and scientific career. The observatory was the most important centre for astronomy at the time so he gained massive prestige from his job. In 1907, Štefánik received the Prix Jules Janssen, the highest award of the Société astronomique de France, the French astronomical society. At the end of 1907, however, Janssen died and Štefánik lost his job. Since 1908, he had been charged by the French authorities with astronomical and meteorological observations, (mainly observations of solar eclipses) and political tasks in various countries all over the world, including (Algeria, Morocco, Turkistan, Russia, India, the United States, Panama, Brazil, Ecuador, Australia, New Zealand, Tahiti, Fiji, and Tonga). In Tahiti, he also built an observatory and a network of meteorological stations (rumour has it that much of his time in the Pacific Ocean was spent on spying on German positions). Between the trips, he regularly returned home to Košariská (the last time in 1913 for his father's funeral). In South America (especially in the Galapagos Islands in Ecuador), he had an opportunity to show his diplomatic skills for the first time. Štefánik worked in astrophysics and solar physics, and became well known for his spectral analysis of the sun's corona. He was involved in perfecting spectrography and has been considered a predecessor of Bernard Lyot. He also attempted to construct a machine for colour photography and cinematography, and he had his design patented in 1911. In addition to his scientific missions overseas, he also performed diplomatic tasks. He established contacts and friendships with leading scientific, artistic, political, diplomatic and business personalities. He participated in the establishment of business enterprises in France and other countries. His friends included physicist Henri Poincaré, Eugéne Aymar de la Baume, Joseph Vallot (the richest man in France), architect Gustave Eiffel, Roland Bonaparte, Prime Minister Camille Chautemps, a French entrepreneur called Devousoud from Chamonix, American astronomer and admiral Simon Newcomb and American diplomat David Jayne Hill. In 1912, he received French citizenship, recognition and access to the French élite. On 20 October 1917, he was made a Grand Officier of the Legion of Honour. At the same time, he had some personal problems and a serious stomach illness, which did not get better even after two surgeries. Moreover, World War I had started in Europe. 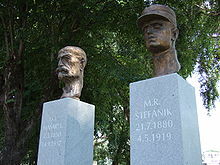 Masaryk and Štefánik's monument in Košice, Slovakia. Štefánik believed that defeat of Austria-Hungary and of Imperial Germany would offer an opportunity for the Slovaks and the Czechs to gain independence from Austria-Hungary after the war. Therefore, he joined the French army and trained to become an aviator. He flew MFS-54s for the 10th Army on the Artois and was later transferred to MFS 99 Squadron on the Serbian Front. In May 1915, he flew a total of 30 missions over enemy territory. The Serbian campaign was unsuccessful, but French aviator Louis Paulhan is credited with the world's first "medevac" by flying the seriously-ill Štefánik to safety. Štefánik returned to Paris at the end of 1915, where he became acquainted with Edvard Beneš and renewed his association with his former professor, Masaryk. In 1916, the three men founded the Czechoslovak National Council, which led to the government of Czecho-Slovak resistance abroad and to the creation of Czechoslovakia in 1918. After 1917, he became vice president of the council. His diplomatic skills made Štefánik able to help arrange a meeting of Masaryk and Beneš to meet and obtain the support of some of the most important personalities of the Triple Entente. For example, he organized Masaryk's meeting with the French prime minister, Aristide Briand. In May 1918, Štefánik went to Siberia to try to rally the Czechoslovak legions to a renewal of the Eastern Front, as Bolshevik Russia had withdrawn from the war by signing the Treaty of Brest-Litovsk with Germany and Austria-Hungary in March 1918. The Czechoslovak Legions rebelled against a subsequent Bolshevik order to disarm and so gained the support of the Allies. Štefánik then decided that his initial plan was no longer feasible. In January 1919, after the war ended, Štefánik went from Russia to France and Italy, where he organized the March retreat of Czechoslovak troops from Siberia to Paris. In addition, his diplomatic skills were needed to solve disagreements between the French and the Italian missions in Czechoslovakia. In April, he went from Paris to Rome to negotiate with the Italian Ministry of War, where he met with his fiancée, Juliana Benzoni, for the last time. Then, he went to the main Italian military base in Padua, where he agreed with General Armando Diaz to dissolve the Italian military mission in Czechoslovakia. Masaryk continued to accord Štefánik his full confidence to the last days of his life, as demonstrated by the challenging issue that Štefánik had to solve while he was Minister of War of the Czechoslovak Republic: disputes with the military missions of France and Italy on Czechoslovak territory, according to his telegram to Masaryk on 21 April 1919, only a few days before Štefánik died. When Štefánik wanted to return home to see his family, he decided to fly from Campoformido, near Udine, Italy, and to use an Italian military plane, a Caproni Ca.3. On 4 May 1919, at around 11:00, his plane tried to land near Bratislava, a military conflict area between the First Republic of Czechoslovakia and the Hungarian Soviet Republic, but crashed near Ivanka pri Dunaji. Štefánik died, along with the rest of the crew (two Italian pilots, Colonel Giotto Mancinelli Scotti and Sergeant Umberto Merlino, as well as a mechanic-radiotelegrapher, Gabriel Aggiusto). The reason for the crash is disputed. The official, false explanation was that the airplane crashed because of bad weather, but it was really sunny with only mild wind. However, the official and thorough investigation was not performed for more than seven years. At the time of the crash, Vavro Šrobár and his entire government had left Bratislava for Skalica, to plant trees as a memorial to the founding of the new Czechoslovak Republic. The Hungarian communists, in the middle of Bratislava's Franz Joseph Bridge, could not have shot down the plane. The Italian plane's identifying colours, a rumour had it, were mistaken for the similar marking of a Hungarian plane so the unannounced, unknown airplane was shot down by the Czechoslovak Army. However, the respected Zrínyi Miklós National Defense University in Budapest, in a joint article with the Armed Forces Academy of General Milan Rastislav Štefánik in Slovakia, published a paper, citing the Italian eyewitness First Lieutenant Martinelli-Scotti: "in the course of the first landing attempt, the wheels touched the landing path, after which the cooling water immediately started leaking. That caused the overheating of the engines. During the second landing attempt, one of the engines exploded, resulting in catastrophe". Štefánik's tomb was built in 1927 to 1928 on Bradlo Hill in Brezová pod Bradlom. The monumental but austere memorial was designed by Dušan Jurkovič. The minor planet 3571 Milanštefánik (discovered 1982 at Kleť Observatory) was named after him. Slovak Government Flying Service aircraft Airbus 319 and Fokker 100 are painted with Štefánik's portrait. The Slovak Armed Forces Academy is named as Armed Forces Academy of General Milan Rastislav Štefánik. The transport wing of the Slovak Air Force located at Malacky Air Base was named as Transport Wing of General Milan Rastislav Štefánik. In 2019, Slovakia will launch a 2 euro commemorative coin commemorating the 100th death anniversary of Štefánik. ^ a b c d "Valóság – A tudós, a francia tábornok, a csehszlovák miniszter és a szlovák hazafi" (in Hungarian). Dr. Tőkéczki László and Dr. Kapronczay Károly. 2008. Retrieved 3 August 2008. ^ L'homme-vent, special issue of L'Ami de Pézenas, 2010, ISSN 1240-0084. ^ "Issuance schedule for commemorative and collector coins in 2019 and 2020". National Bank of Slovakia. Retrieved 14 December 2018. .
Richard McKim: "Milan Štefánik and the rotation period of Venus", Journal of the British Astronomical Association vol. 117, p. 7-8, 2007. This page is based on the Wikipedia article Milan Rastislav Štefánik; it is used under the Creative Commons Attribution-ShareAlike 3.0 Unported License (CC-BY-SA). You may redistribute it, verbatim or modified, providing that you comply with the terms of the CC-BY-SA.